Fast forward to today and he’s happily married to Sarah who also loves to sail. After selling the first boat he purchased (a Sabre 28), they bought their second boat in 2011 (a Niagra 35). They live on her (s/v BLUE) during the summer when they can rent out their home to fellow beach goers in Nags Head, NC. Working and saving and enjoying life, they also love to travel; so, when they expressed interest in joining us, we said of course! They arrived in Newcastle-upon-Tyne late afternoon where we picked them up and returned to Hartlepool. The sun was still strong and bright thanks to being so far north, so we enjoyed some evening time in the cockpit. 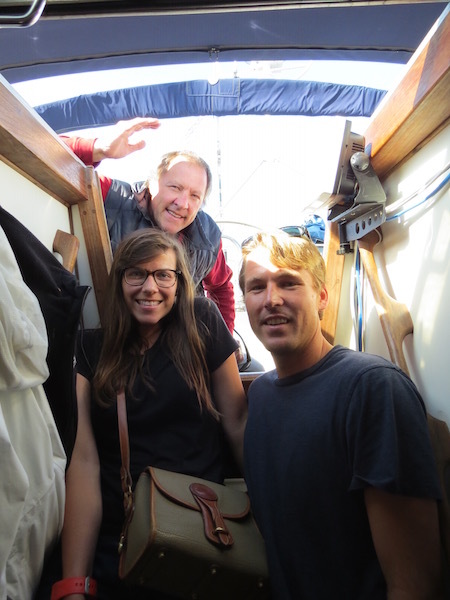 It was quite special having these two young people aboard. Now, if only the weather would cooperate for sailing! We had been checking the weather and it seemed the best time to go was mid-week. But, it wasn’t just wind we needed to take into consideration. To enter Amble, our next port of call, we had to arrive 2-3+ hours on other side of high tide thanks to a sill that kept water in the marina. Outside of the marina in the channel it could get as low as 3 feet. Fortunately, we had all the info aboard in charts and books. While waiting for weather we used the car to take them to several of our favorite haunts, the first being Whitby where they experienced a crowded Sunday stroll around the priory and down in the cobble-stone town. It was Sarah’s first time in Europe, and Iain’s first time in England, so the humongous ruins of the abbey required some photoshops. We headed out along one of the jetty and passed others out enjoying their Bank Holiday weekend. I couldn’t resist this pic of a family eating their fish & chips. They’d make a great ad for whomever sold them those take-away meals. We satisfied ourselves with ice cream cones. We stopped by the James Cook Museum but only to look around outside. and, I pulled out cheese bits. Then, we toasted having them aboard with Juanona glasses they had given us several years ago. Monday we left for Hadrian’s Wall, where we all enjoyed just being outside stretching our legs. Use to living in a confined space, they quickly fit into JUANONA’s routine, even taking over the nightly duty of dish washing and drying. Wednesday was the day we could leave, but it had to be at 4am in order to get out of the lock in Hartlepool. Fortunately, it started getting light at 3:45am; and, the four of us got up, untied from the pontoon and headed just around the corner to the lock. After waiting for the water to fill, we exited motoring slowly as we made our way out to the harbor. But, all of a sudden we all felt ourselves stopping a bit. Sure enough, JUANONA was hitting the bottom. Max told Iain to unfurl the jib while Sarah and I held our breaths as we untied the fenders and lines in prep for stowing. We made it past the shallow parts and into the open water. Thank god we left 30 minutes earlier than originally planned. The marina guys had mentioned we might want to do that because the high pressure we were in actually lowers the water below the charted tide levels. If we had left any later, we’d probably have been sitting there for a good while as we waited for the tide to go all the way out and then start back in again. Not a good feeling. arriving at Amble almost three hours ahead of our ETA thanks to the winds maintaining their strength. The marina people are extremely welcoming, just like in Hartlepool. It’s filled with both pleasure boaters and fisherman, and the camaraderie is immediate. We walked around town with Max in search of a boat part, which he found at a candy store. Since it had some remaining lollipops in it, the crew obediently began to empty out the container. Now, to modify it to ensure the perfect fit. As I mentioned, Sarah and Iain are boat people, so they didn’t mind the usual hanging laundry lines used when rain instead of sun appears. The next day Iain, Sarah and I walked to Warkworth Castle, just a mile from the marina. It was typical showery-sunny day, and Sarah saw her first castle, which happened to belong to the Percy family, the Earls of Northumbria. This was their second home, the first being the larger Bamburgh Castle where the Kings of Northumbria had held court (we briefly checked that out on our coastal-route drive the next day). Friday we headed to Holy Island or Lindisfare where St. Cuthbert (the guy finally buried in Durham Cathedral) landed after being inspired by St. Aidan. To provide some background: Aidan was an Irish monk who lived on the island of Iona in southwest Scotland. However, this monk’s fame really grew thanks to a young boy. This young man, Oswald, the second son of the Northumbria king Aethelfrith, fled to Iona after his father was killed in battle in 616 c.e. Oswald embraced Christianity; and, when he became king in 633, he established a mission on Lindisfarne under Aidan’s care. Unlike other monasteries, Lindisfarne was only for men and boys, the reason being women wouldn’t have been able to do Aidan’s type of missionary work (walking the streets and accosting strangers, which is how Aidan knew to convert folk to his religion; at least Aidan recognized the importance of female leadership since he is credited with placing Hilda as the Abbess of Hartlepool and Whitby.). At this point it was the Irish Ionian monks who were spreading the word; so, to ensure the mission wouldn’t die out once they died off, Aidan set about establishing Lindisfarne as a place of learning. He died in 651 at King Oswald’s Bambrugh castle. While Aidan was busy with the Priory of Lindisfarne another monk, Cuthbert, was gaining a reputation for devotion and sanctity. He became Prior of the Melrose monastery (in southern Scotland) in 664. That same year the Synod of Whitby (held under St. Hilda) settled whether the Celtic Rite or the Roman Rite was right. Turns out the Roman Rite was agreed upon. Cuthbert was then assigned to Lindisfarne to transition that monastery from Celtic to Roman. Soooo, a long explanation on how these two saints’ lives intertwined and why they are so important to Christians of England. To reach this holier-than-thou island you had to wait for the tide to clear the causeway, which meant we had lunch (notice pickle jar on car roof :) while waiting for water to drain off the one road on/off this island. No Moses arrived to part it, just Mother Nature. There were warnings in the car park, too, about watching the tides and not getting caught out. We walked around the bottom of the castle, built in 1550 during Henry VIII’s time after the dissolution of the monasteries (1536-40). Around the castle cairns and sheep covered the marshy expanse, and the sun came out in between showers. Opportunities for selfies with sheep occurred as we strolled back to the harbor. In just our brief time spent going to and from the castle, the harbor had started to dry out. We also saw a beach of seals basking in the shallow waters as well as a cross on a small island looking towards the mainland. Climbing a hill at the head of the harbor we looked down at the priory. The priory was constructed in the 11th century next to where St. Aidan’s Irish monastery stood. We recognized the typical Norman archways and saw a sketch of what these ruins would have looked like way back when. The little museum had some surprising finds, such as how brightly colored some of these stone works would have been. Below are replicas of two, rare Anglo-Saxon stones. These are rare because they named two people, Osgyth and Beannah, who lived and worked at the community when the Lindisfarne Gospels were created. These colors were found through x-ray fluorescence and magnification. So strange to think of these ancient sites in full color when we’re only seeing them way past their heydays in muted beiges and grays. We left the island and headed back timing it to ensure we crossed without any water under the car. Saturday dawned clear and bright with Iain and Sarah taking a long walk, and Max and I hanging out. Sunday we dropped them off at the station to catch the train to Edinburgh. This entry was posted in 2015 05 UK - East Coast, 2015 Summer Cruising, COUNTRY, England, Europe, SUMMER CRUISING on June 9, 2015 by margaretlynnie. Loved seeing the photos of Iain & Sarah. Last time I saw Iain was on a Nags Head cottage in the ’80’s. He looks a lot like his handsome dad! How great that he & Sarah could come over for a visit. You’re an awesome tour guide, Lynnie! You are certainly becoming the expert in British history…and so are we! To sail at the elbows of you and Max for any length of time would be a master course in cruising. Lucky Iain and Sarah. And nice to have people on-board who “get” it. Looks like you all had a blast together. Love to all.